This is some lovely angora I bought from Bigwig's Wardrobe at Wonderwool. 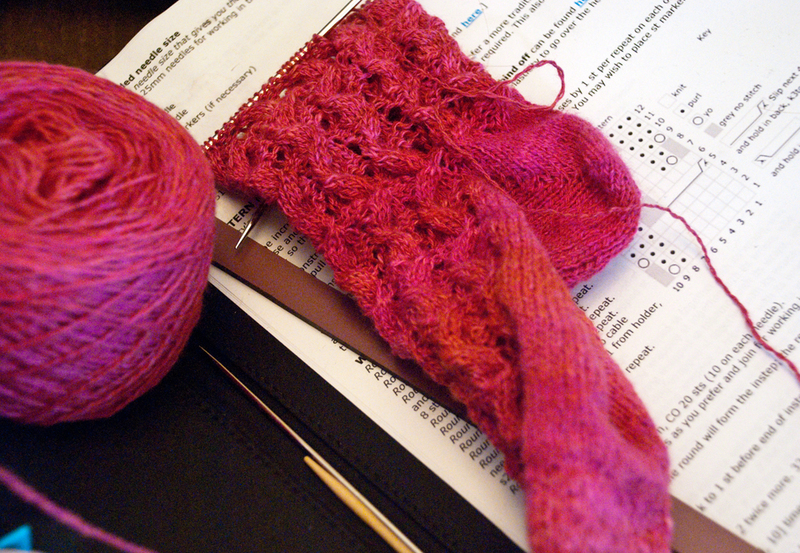 It's going to be a fluffy pair of lacey wristwarmers. 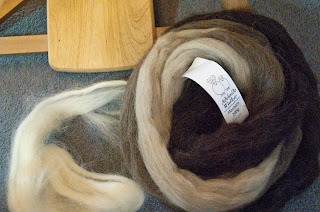 The Tour de Fleece will see me spinning every day over the next couple of weeks, so I expect to make some progress with the angora. It's also the reason I've started this project, the sheep carousel tea cosy. I LOVE the pattern and will make the sheep in alternating colours. On the knitting front, this is the Sisterhood Cowl from Shared Secrets (aka Secret Spinner). The yarn is merino / tencel (hence the silky sheen) dyed by Patricia of Yummy Yarns UK. I know the designer and the dyer and I love the fact that this is such a collaborative project. I thought the cowl would be a long-term knitting project, but it's on big (6mm) needles and I've opted for shorter rounds so it's knitting up really quickly. This next one is the opposite. Very fine yarn and thin needles, plus cables in the pattern. It's all worth it, I really love the pattern (Piccole Onde) and can't wait to wear them. The wool is lovely - wook/yak/silk from Picperfic's luxury fibre club. According to Ravelry I have five other projects on needles. Some I've not touched for years. I'm wondering whether to pull some of those out. Are you like me and just keep dormant projects on life support for years, or are you quick to frog something that's not going so well? Very fluffy angora, will be lovely cosy wristwarmers. That Masham is dreamy, I enjoy spinning masham, loving the colour graduation. Will make a beautiful sheep carousel. I try not to leave projects dormant for too long, if I've left it because I don't like something I would rather frog it and knit something I'm happier knitting. 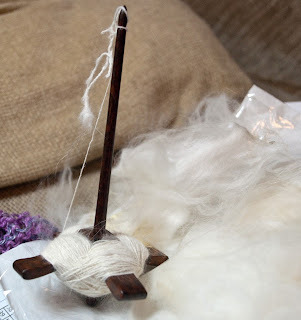 I love spinning angora; it's so soft and cozy. Everything else is beautiful! Dawn I really love the Masham. 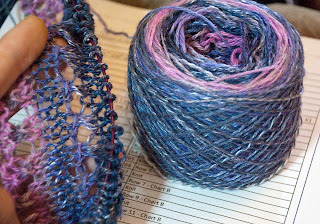 It's a bit coarse and a little bit prickly (good for the project - not to be worn) but now that I've finished the first skein I find that it's really lustrous - a slightly silky look to it.